The article is designed to be informational, not editorial. 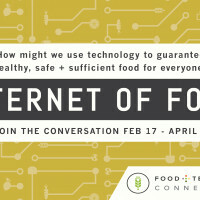 The views expressed here are those of the author and do not necessarily reflect the views of Food+Tech Connect. 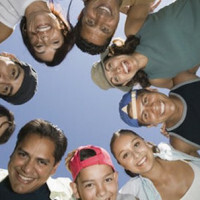 It is probably worthwhile to pay attention to anyone who stands between you and your customers. This is the reason that Internet companies such as Google and Facebook are so concerned with “net-neutrality” and the broadband providers such as Comcast, Verizon and AT&T. 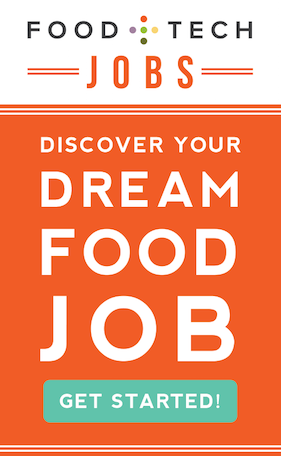 If you are in the business of selling food, the equivalent is probably food distributors such as Sysco and US Foods. This week, hearings begin as the U.S. Federal Trade Commission (FTC) tries to block the merger of the nation’s two largest foodservice distributors—Sysco and US Foods. These companies play a crucial role in getting food from manufacturers to consumers, distributing food and related products to restaurants, healthcare and educational facilities, lodging establishments and other foodservice customers. Sysco alone has over 400,000 business and institution customers across the US, with sales in excess of $46 billion a year, and US Foods is about half as large. Distribution has long been the juggernaut of the food industry. When people used to grow much of their own food and/or purchase from their local farmers, distribution was relatively simple. But in today’s complex global, industrialized marketplace, distribution is often the “Alpha and the Omega,” and one the biggest barriers to new entrants entering the market and competing effectively. Under federal law, a merger or acquisition of this magnitude must undergo review to ensure that the resulting entity will not be in a position to restrict trade or unfairly leverage their power. In the case of the recently attempted acquisition of Time Warner Cable by the largest cable provider Comcast, this review was done by the U.S. Department of Justice (DOJ). 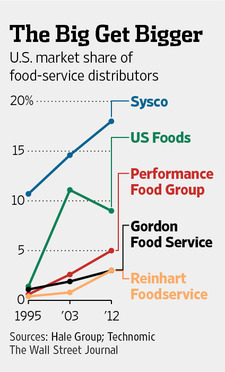 For Sysco-US Foods, it is the FTC. A central aspect of any antitrust review is defining the relevant market. In the case of Sysco-US Foods, the FTC determined it to be “broadline”—as opposed to specialty or local—distribution. Broadliners, also known as “soup to soap”, provides (as their nickname implies) access to more than just food. These companies purchase everything from fresh produce to meat to dry goods and paper products at bulk, wholesale prices, and then portion them out to sell them to restaurants and foodservice providers, with a markup ranging from 10 to 50 percent. The markup percentage range is quite large and the range can have an enormous impact, especially on new entrants. 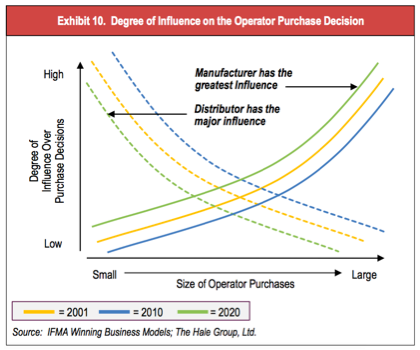 As the chart to the right shows, small manufacturers and small operators are the most vulnerable to the influence of large distributors. Further complicating the situation, big distributors often utilize “year-end rebates,” which are not typically passed along to consumers. 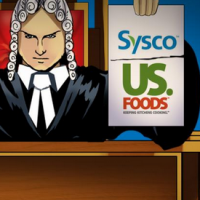 While certainly not dispositive, it is worth noting that Sysco and US Foods do have a long legal history of alleged wrongdoing. In addition to numerous lawsuits and settlements for over-charging customers, Sysco last year agreed to pay $19.4 million in penalties and restitution after an investigation exposed the company’s longstanding practice of storing meat, produce, dairy, and other fresh food in dirty, unrefrigerated, outdoor storage units. Large mergers and acquisitions in the U.S. market have become quite common, and it’s quite rare for the government to publicly challenge them. In the case of recently proposed Comcast/Time Warner merger, the DOJ expressed concerns about a post-merger Comcast controlling over half of the broadband market and possibly being able to impose anticompetitive behavior on video-streaming services. In a competitive market, these businesses would have a viable alternative. But the government is loathe to permit what is perceived to be a “merger to monopoly,” especially in a distribution business that requires massive infrastructure for any new competitor to replicate. Lawrence Williams is an entrepreneur who is passionate about technology, food and health. He is the Chairman of the United States Healthful Food Council, which manages the REAL Certified nutrition and sustainability food and foodservice certification program. He has dedicated his career to developing public-private partnership solutions to some of the world’s most vexing problems. Most recently, Lawrence helped Elon Musk and SpaceX collaborate with NASA to develop a domestic commercial crew and cargo program to replace the Space Shuttle. Prior to SpaceX, he was the lead for wireless pioneer Craig McCaw and Bill Gates’ Teledesic in negotiating the radio frequency access to make broadband access ubiquitous through the use of low-Earth orbiting satellites. Copyright © 2015 Food+Tech Connect. All Rights Reserved. Made in New York.